For the third year running, The Story gathered an eclectic bunch of creatives from all corners to tell their stories and talk about storytelling. It’s interesting to see how the event has evolved over the years. When it first began the result was unexpected – most who’d come for a bunch of presentations about the ‘process of narrative’ were instead treated to more of a stories round a campfire affair. I loved it, but I know some people were after something a bit more explanatory and, for better or worse, this is what the event seems to be leaning towards. The 2012 event still had the variety; music, games, photography, art, design, programming, magazines, journalism and anarchism. Yet there are more one on one ‘Inside the Actor’s Studio’ style interviews now than at that inaugural event, with the majority of talks discussing a project (often a pet one) and how they went about it. Not that that is a bad thing – we’re all keen to learn. But I felt the best talks were the ones that, even if about a particular piece of work, encompassed something of the speakers personal, rather than professional, experiences and how it changed them. Maybe it’s my own need for that kind of personal detail to connect with the story. Number one by a country mile for me was blogger Liz Henry’s riveting account of her role in uncovering the Gay Girl in Damascus hoax. It told of empathy, humanitarianism, politics, sock-puppetry, the power (and dangers) of internet life, identity theft and human motivations. Many in the room had probably read about it in the news, but Henry’s perspective of swapping emails, forum discussions, blog posts, personal attacks and inner conflict gave it more. She told us of the stories within the story, of her guilt at doubting someone in trouble, of the forum poster she started emailing who she at one point suspected of being the hoaxer, of late night sobbing phone calls, clues within names she followed around the US, of the mutability of the story and how multiple false stories strengthen each other, the bizarreness of the growing ‘Amina entity’ and the fallout for both Middle East and lesbian bloggers as a result of ‘bad allies’. There was genuine shock and sadness around the room as she talked of “fake lesbians all the way down” on of the net’s most prominent gay forums. But the whole talk was also enhanced by her humour – the most human thing is our ability to see the funny side of a traumatic experience. This was a story of political failure, said Tom Watson MP. But it’s also a story about how a story changes you when you get swept along in one. Columbia Professor of Journalism and ex-Guardian Director of Digital Content Emily Bell interviewed a central figure in one of the biggest news stories of the last 10 years on how, as Bell put it, “someone who’s only known to people like me becomes someone who’s now asked for his autograph on the street” (“It means you have to think twice about having more than three pints in a West Brom pub,” said Watson). It was fascinating just to hear of the interplay between journalism and politics. Watson told of the Press Association reporter who had to decline part of the story because “it’s more than my job is worth” (PA is owned by News International). Bell told of the dichotomy between what editors first thought and the evidence that web stats can provide to back news hunches – the earliest hackgate stories were trending in the Top 5 most read for Guardian.co.uk while some editors were convinced this was a mainly a media-interest-only story (the Dowler revelations changing all that of course). She also marvelled at the serendipity of its timing. Hackgate broke at a time when there was little else to stop it getting the frontpage. “What if something had happened to the Royals or David Beckham?” she wondered. And it’s a story that continues of course, the talk taking place to the backdrop of the Leveson inquiry and on the day that Rupert Murdoch announced his intention to soon launch the Sun on Sunday. It’s “like surfing a great wave 24/7,” said Watson. 3. Data collection is normal. Contemporary art is still fabulously bonkers. Confessions of a Recovering Data Collector is the title of “artist activist administrator” Ellie Harrison’s 2009 book. It tells of how a mundane office job turned into an obsession with recording everyday aspects of her life (not in a Facebook sort of way, but in an Excel spreadsheet way). She talked to us about her life’s changes and how data collection was a part of and a catalyst of that, as well as talking through some of the, frankly, mad but amazing installations that have resulted. These include the office chair disco, the vending machine that dispenses a packet of crisps every time the word ‘recession’ is mentioned on BBC News (I want this for our office) and the photo collection of everything she ate in 2001 (now on display at Wellcome Collection). This was a great talk combining a personal story with a bit of process of what you can do with the wealth of data we all generate. And some crazy photos. But it also made you think about the role of data collection in our modern lives, and how, with apps, social media and ramification, recording your every bit of food, physical activity or otherwise is actually pretty normal. Though maybe not in a spreadsheet. Scott Burnham is a “social entrepreneur, creative strategist, creative director and writer dedicated to reprogramming our relationships with design and the city”. And he came to tell us about Urban Play in Amsterdam. It was an inspiring talk full of great ideas about getting people to take pride, and hence care about, their surroundings. These include putting trees in shopping trolleys (“give people the opportunity to put green where they want it”) and boombox benches that can play your music via bluetooth (the city kids treasured these because of what it offered them). “It’s interesting what happens when you trust people [not to destroy things],” said Burnham. The core of his talk was dedicated to the Stefan Sagmeister Urban Play project, which used 250,000 Euro cent coins to create one of the writer’s sentences. Its remixabiity – and hence vulnerability – was a big part of its appeal (it will degrade (i.e. be trashed or bits stolen) – but how? What will people choose to do?). He showed us an anonymous dialogue that started – coins turned over to dare ‘Do it’, followed by another person’s urge to ‘don’t do it’. The irony is that the artwork did indeed disappear – the police removed the whole thing in a misguided attempt to save it (“It’s ok, the artwork has been secured. You can pick up your 60 bags of coins anytime”). What happens when you take the practice of historical re-enactment and use it to recreate a moment of conflict in recent history, where the wounds are still raw? Through a fantastic array of photos, Deller showed us the Battle of Orgreave – a re-enactment of a confrontation between police and miners in the 1984-5 miners strike. He talked us through how and why he did this – of the strike’s importance in history, but also how it brought disparate communities together – miners, women, gays. He also touched on raw emotions of the history, and the situation, which were such that the authorities worried about the rioters rioting for real. What I liked about this talks was the way he framed it, bookended by a photo of a miner’s sun who’s gone on to be a famous wrestler, posing, in full costume, by a mine shaft with his Dad. How Britain has changed. The man with “the best job title ever”, as host Meg Pickard put it, of course did a little magic trick (distraction through narrative being one of the strongest tenets of magic). And then he did a little technology trick (in the process getting 100 people to watch a video where a bunch of people watching YouTube…). The BBC3 trick he showed us gives, he said ‘the opportunity for anyone to play the part of being a magician”. It’s no more a betrayal of magic, he says, than selling magic kits in toy stores. The beauty of this trick’s narrative is in tapping into something we’d all like have – psychic power, prediction of the future. All magic, says Owen, appeals to that base instinct to crave immortality and surviving the inevitable (think of why cutting the assistant in a box trick is so compelling). One interesting aside from him was this: the best tricks are often summed up in a sentence. It’s why the TV shows he produces have simple titles: The Real Hustle, Derren Brown: Mind Control. You immediately know what they’re about, and hence you’re already bought into the narrative – and are ready to be fooled. Kudos to Tom Chatfield and Phil Stuart from games company Preloaded – they did probably a quarter of their talk about games sans visuals when the technology failed. I always love the indie games talks at The Story, mostly because games are such a different medium, often completely immersive and innovative. Their game about death and philosophy for Channel 4 Education was interesting, and the game looked gorgeous, but it did have me sceptical and curious to see how engaging with the issues it really was. The End comprises a stunningly animated platformer, mixed in with a puzzle element for the boss battles and seemingly a lot of ‘extra’ information about the issues around it. But how much do you engage with the issues when it’s a ‘bit of extra info’ at the end of a level, or with an added click, than when the ideas are a core element of the game itself? I’m thinking primarily of High Tea, a game Preloaded did for my colleagues at the Wellcome Trust. In playing that you were fully immersed in the role of a Victorian opium smuggler in the Chinese Pearl Delta. The issues it wanted to teach came about naturally, rather than in a ‘learn more’ bit. This is something missing, I felt, from the company’s recent work for the Science Museum and I wondered if it was also an issue in developing The End. It’s a tad unfair, I realise, as things like death are a lot more difficult to design a game for (and yes, I am probably biased when it comes to High Tea). Another interesting point raised was audience – Preloaded were intentionally aiming for an atheist/agnostic audience, recognising that 2/3 of kids likely to play the game had no religion or weren’t strongly practicing one. The aim of the project was to make death easier to cope with, hence the heavy element of philosophy and placing your method of thinking on a graph ranked alongside your mates and famous thinkers. I have to admire the many facets of the game, but again, I did wonder if a complex issue necessarily has to lead to a complex game. But if it works – and, crucially, is fun – then your audience is already engaged. 8. Magazines are not dead. In keeping with the subject of the magazine, this wasn’t the most thrilling of interviews. But the content, accompanied by a fabulous slideshow of Karen images, was fabulous. What I liked most was two things: it was a talk about a print magazine (an ex-colleague used to always tell me, to my chagrin, how ‘print is dead’) and that this was a project celebrating the mundane, the the everyday existence. 9. Star Wars and more behind the scenes at the BFI. A bonus 5 min talk from The Story ‘techie’ (really BFI Head of Digital Business Development) Richard Ayers. He took us on a guerilla iPhone photo jolly through the BFI archives, the highlight of which was definitely snaps of George Lucas’s annotated Star Wars script and behind-the-scenes shots like Storm Troopers in the desert without their bottom halves on. I wasn’t entirely enamoured with writer and activist Danny O’Brien’s talk, the last of the day. For one thing I got a little lost in his tale of nerds, coding and liberal anarchy. But he did finish on an appropriate, if slightly sycophantic, note. At last year’s Story event the BBC’s Adam Curtis gave a talk, effectively saying ‘What you’re all doing is great, but how do you know it matters? Doing all these wonderful small things is all well and good, but you’re ignoring the bigger system that inevitably engulfs us all’. O’Brien’s response to this was yes, that’s right. But that doesn’t mean it’s futile. You have to assume that your tiny thing will build and scale. There’s an arrogance to the ‘geek condition’, he said. That what you build can change the world. Without that you limit yourself and your ambition. Yes, we might be playing a stupid game, and maybe what we’re doing as creatives isn’t that serious. But sometimes serious change comes from the silly. Big thanks again to Matt Locke for organising a fab event. For more, go to The Story’s website, where Matt is once again publishing podcasts of the day, and no doubt collating the many blog posts written about it. 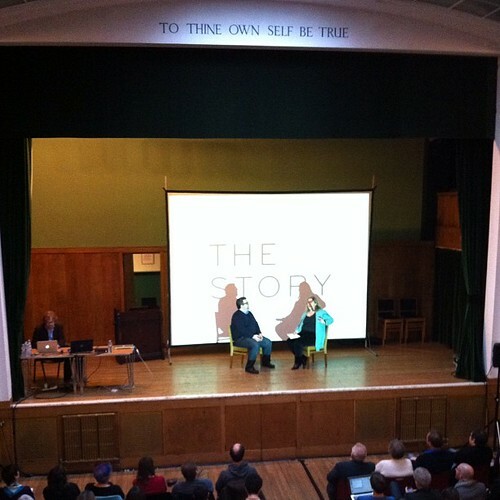 You can also see all the tweets from the day on #thestory2012, which someone will probably (appropriately) Storify.